The first time you do an exercise, there will be a small amount of data entry – but every workout after that will be predicted and there is virtually no data entry! 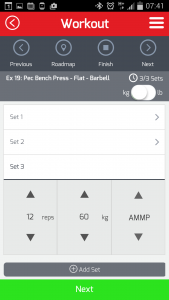 Step 1: Click on Menu For Workout Options and select one workout program. Step 2: Once selected, press start button to start the workout. Note: For your first ever workout there are no predictions. From second exercise and onwards your predictions will be displayed. Step 3: Click Start Button and “Set” bar will indicate that the set is in progress. If you haven’t configured a stop watch with the app, system will assume you are doing your “1010” tempo reps (2 second TUT). Click Stop when you complete the set. The first time you do an exercise, you will not have predicted rests – so just rest the usual time (i.e. train normally) and “Start” the next set when ready. Note: Screen displayed below showing 2 sets are completed and 3rd set is in progress. 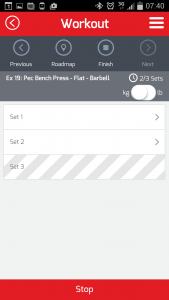 After set 3, the system will present a “Next” button instead of “Start” – hence “Next” will take you to the next exercise. 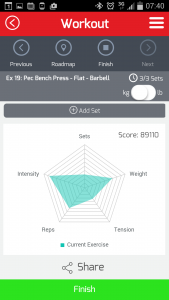 Step 4: When you have completed all sets, you can scroll down to see the Exercise Pentagon which provides a visual summary of your performance. Note: Tension is TUT per repo and also takes into account how long you are actually under tension, or whether you are resting between reps. Intensity: Intensity relates to rests between sets – the shorter rests = High intensity. Weight is shown scaled to your 1RM – The system calculates your 1RM from the reps you achieved in the sets. 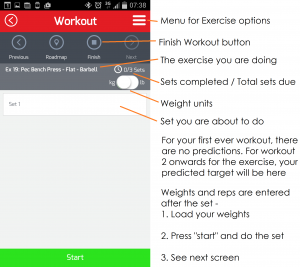 Once you have done exercise you will get predicted targets in future workouts, including the number of sets to do. The system will automate this. For the first ever exercise the default sets are 3 but you can do more by tapping on “Add Set”. You can also stop at 2 sets and simply select “Next” at the top left of the screen (the bottom button will still show “start”) – the “next” button will take you to the next exercise. 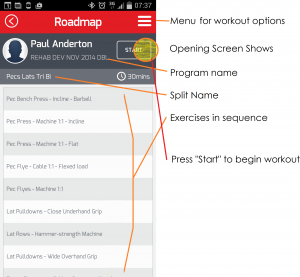 The system will remember for future workouts that you only do two sets. It may eventually push you harder however and then upgrade you to 3 sets when the time is right.